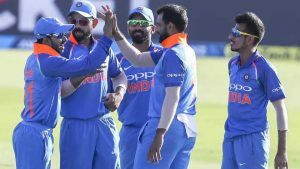 India wrapped up the One Day International series in New Zealand with yet another win in the third match. The visitors won the match by seven wickets with 42 balls left to play. India chased New Zealand’s total of 243 in 49 overs. The team took the match with 245/3 in 43 overs. New Zealand won the toss and decided to bat first. Despite good totals from Ross Taylor and Tom Latham with 93 and 51 runs respectively, there was not enough support. Add in the quality Indian bowling, and there was little hope for the New Zealand cricket team. Captain Kane Williamson noted that there is a reason India is the number one cricket team in the world. He said that while there were improvements in the Black Hats’ batting, they had much to learn about bowling. Virat Kohli, India’s skipper, commented that the team has had three clinical games in this series so far. Kohli is pleased with his team’s performance, and feels the team is in a good place. Kohli announced that he plans to take a break now that India has won the series. He has not had a break for quite some time, and feels that now is a good time to do so. India is likely to play some of its young talent in the upcoming ODIs now that the series is in the bag. This gives the younger players time to grow and play international cricket. Mohammed Shami, the Man of the Match, noted that it is difficult when bowling against the wind. He noted that while one bowler bowls against the wind, the other bowls with it. Either way, the bowlers adjust to the conditions. The fourth ODI will take place in Hamilton on Thursday 31st January 2019.